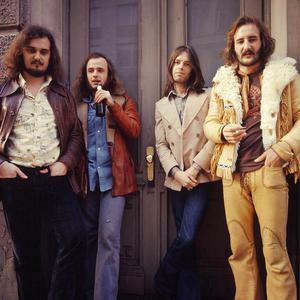 Focus is a Dutch progressive rock band founded by classically trained organist/flautist Thijs van Leer in 1969, along with guitarist Jan Akkerman. They are one of the most well-known and influential rock bands from the Netherlands. They successfully fuse inspired jazz, rock, and blues improvisation, classical musical structures, and accessible pop melodies into a powerful and instantly recognizable sound. Akkerman's technical mastery of the guitar and the often unpredictable brilliance of his improvisations were the perfect counterpoint to Van Leer's extensive knowledge of musical styles and disciplined approach to composition. Van Leer's tongue-in-cheek musical references include the reworking of motifs from an early Monteverdi opera in the extended piece "Eruption" on the Moving Waves album, the contrapuntal passage in the middle section of "Carnival Fugue" on the Focus 3 album, the Renaissance-era harmonic progressions in "Anonymous II" (also on Focus 3), and the quote from the first chorale of J.S. Bach's oratorio St. Matthew's Passion in the track "Father Bach" on "Mother Focus". Focus are possibly best known for their "Hocus Pocus", a top 40 hit from the Moving Waves LP, which included inspired bits of yodeling (believe it) and explosive guitar work. The works of both composers display an impeccable melodic sense more often found in pop songs and Broadway showtunes than in progressive rock compositions. It is to the regret of many rock fans that Thijs van Leer and Jan Akkerman were unable to continue their collaboration, as together they were more than the sum of their formidable parts. Akkerman's "House of the King" (from the "In and Out of Focus" album) is the title theme of 'Don't Ask Me', a science-based British TV show of the 1970s that made household names of Dr. Magnus Pyke and Professor David Bellamy. It is also the title theme of Steve Coogan's BBC2 sitcom Saxondale. It is often mistaken for a Jethro Tull song.